I love taking pictures of clouds. I have no idea what I’ll do with them, but I ooh and aah over them to no end. I’m actually struggling a bit with this right now and have taken off a few days from my photo a day project. I love my pictures of clouds and flowers, gardens and cute little homes. But 20 years from now, what will they matter? What I’ll want to see is what I was doing – the people in my life, my pets, my hobbies, the things I did with my life. I recently found an album of a family trip that from over 40 years ago. My Dad labeled all the photos very nicely. The mountains are pretty and so are the pictures of the gardens and hotels. But what I want to spend time on are the pictures of my grandparents and great-aunt, of how young my mother looked, of the things my sister and I did during that trip. So I’m taking a little break, thinking through what I want to do with this project besides take more pictures of downtown, which is about all I have available during the week. 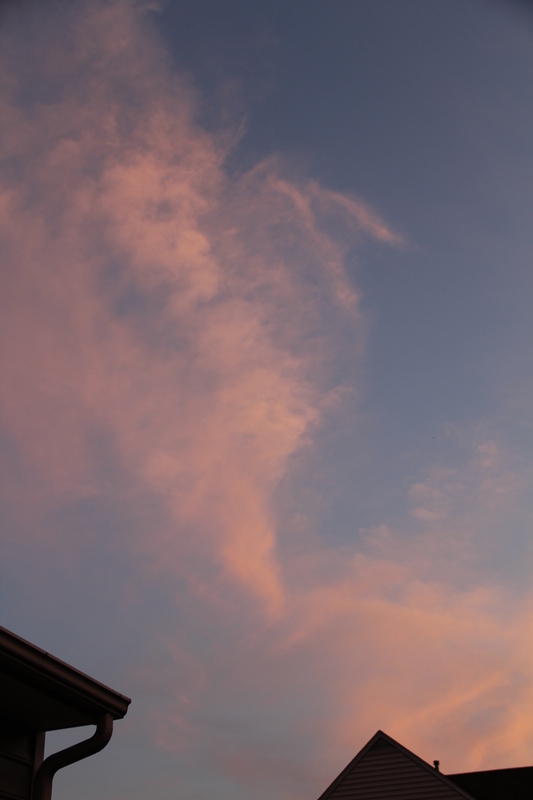 In the meantime, here’s a cloud picture from earlier this year, with delicate shades of pale pink. Word for tomorrow – NIMBLE. If you prefer to work ahead, see the list for the week under “A Word A Day”.